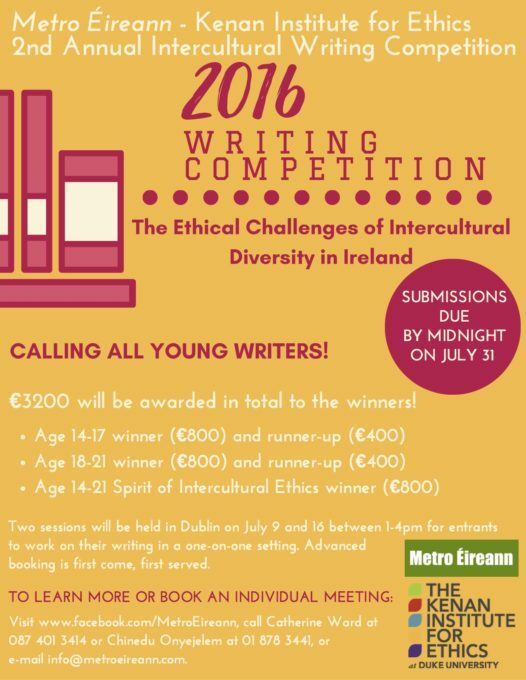 Metro Éireann, in collaboration with the Duke University Kenan Institute for Ethics, is hosting an intercultural writing competition for young people in Ireland. The competition is completely free, and cash prizes will be offered to the winners. To learn more or book an individual meeting, please visit https://www.facebook.com/MetroEireann call Catherine Ward at 087 401 3414 or Chinedu Onyejelem at 01 878 3441, or e-mail info@metroeireann.com.